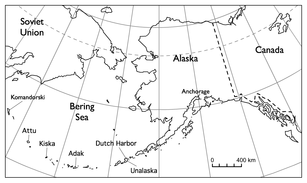 A map of the Bering Sea region. The Aleutian Islands Campaign was a military campaign conducted by the United States and Japan in the Aleutian Islands, part of the Territory of Alaska, in the American theater and the Pacific theater of World War II starting on 3 June 1942. A small Japanese force occupied the islands of Attu and Kiska, where the remoteness of the islands and the challenges of weather and terrain delayed a larger U.S.-Canadian force sent to eject them for nearly a year. The islands' strategic value was their ability to control Pacific transportation routes, which is why U.S. General Billy Mitchell stated to the U.S. Congress in 1935, "I believe that in the future, whoever holds Alaska will hold the world. I think it is the most important strategic place in the world." The Japanese reasoned that control of the Aleutians would prevent a possible U.S. attack across the Northern Pacific. Similarly, the U.S. feared that the islands would be used as bases from which to carry out a full-scale aerial attack on cities and ports in the U.S. West Coast. 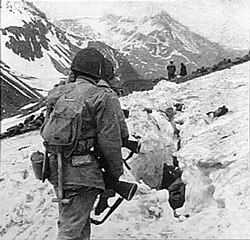 A battle to reclaim Attu was launched on May 11, 1943, and completed following a final Japanese banzai charge on May 29. On August 15, 1943, an invasion force landed on Kiska in the wake of a sustained three-week barrage, only to discover that the Japanese had withdrawn from the island on July 29. 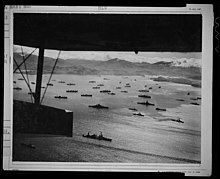 Before Japan entered World War II, its Navy had gathered extensive information about the Aleutians, but it had no up-to-date information regarding military developments on the islands. Admiral Isoroku Yamamoto provided the Japanese Northern Area Fleet, commanded by Vice-Admiral Boshiro Hosogaya, with a force of two non-fleet aircraft carriers, five cruisers, twelve destroyers, six submarines, and four troop transports, along with supporting auxiliary ships. With that force, Hosogaya was first to launch an air attack against Dutch Harbor, then follow with an amphibious attack upon the island of Adak, 480 miles (770 km) to the west. Hosogaya was instructed to destroy whatever American forces and facilities were found on Adak—the Japanese did not know the island was undefended. Hosogaya's troops were to return to their ships and become a reserve for two additional landings: the first on Kiska, 240 miles (390 km) west of Adak, the other on the Aleutians' westernmost island, Attu, 180 miles (290 km) west from Kiska. Because United States Naval Intelligence had broken the Japanese naval codes, Admiral Chester Nimitz had learned by May 21 of Yamamoto's plans, including the Aleutian diversion, the strength of both Yamamoto's and Hosogaya's fleets, and that Hosogaya would open the fight on June 1 or shortly thereafter. When the first signs of a possible Japanese attack on the Aleutians were known, the Eleventh Air Force was ordered to send out reconnaissance aircraft to locate the Japanese fleet reported heading toward Dutch Harbor and attack it with bombers, concentrating on sinking Hosogaya's two aircraft carriers. Once the enemy planes were removed, Naval Task Force 8 would engage the enemy fleet and destroy it. On the afternoon of 2 June, a naval patrol plane spotted the approaching Japanese fleet, reporting its location as 800 miles (1,300 km) southwest of Dutch Harbor. Eleventh Air Force was placed on full alert. Shortly thereafter bad weather set in, and no further sightings of the fleet were made that day. Prior to the attack on Dutch Harbor, the Army's 4th Infantry Regiment, under command of Percy E. LeStourgeon, were established at Fort Richardson. Col. LeStourgeon had previously designed a layout of base facilities—such as isolation of weapons and munitions depots—so as to protect against enemy attack. According to Japanese intelligence, the nearest field for land-based American aircraft was at Fort Morrow AAF on Kodiak, more than 600 miles (970 km) away, and Dutch Harbor was a sitting duck for the strong Japanese fleet, carrying out a coordinated operation with a fleet that was to capture Midway Island. Making use of weather cover, the Japanese first raided the naval base at Dutch Harbor on June 3, 1942. The striking force was composed of Nakajima B5N2 "Kate" torpedo bombers from the carriers Junyō and Ryūjō. However, only half of the striking force reached their objective. The rest either became lost in the fog and darkness and crashed into the sea or returned to their carriers. Seventeen Japanese planes found the naval base, the first arriving at 05:45. As the Japanese pilots looked for targets to engage, they came under intense anti-aircraft fire and soon found themselves confronted by Eleventh Air Force fighters sent from Fort Glenn Army Air Field on Umnak. Startled by the American response, the Japanese quickly released their bombs, made a cursory strafing run, and left to return to their carriers. As a result, they did little damage to the base. The Japanese invasions of Kiska on June 6 and Attu on June 7 initially met little resistance from the local Unangax, also known as Aleuts. Though the Navy had offered to evacuate Attu in May 1942,  the Attuan Unangax chief declined. Little changed for the Unangax under Japanese occupation until September 1942 when Japan's Aleutian strategy shifted. It was at this point that the Unangax were taken to Hokkaido, Japan and placed in an internment camp. The invasion of Attu and imprisonment of the local Unangax, became the justification for the United States' own policy of forcible evacuation of the Unangax in the Aleutian Islands. Unangan civilians were placed in internment camps in the Alaska Panhandle. 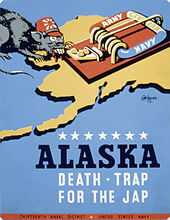 US military propaganda poster from 1942/43 for Thirteenth Naval District, United States Navy, showing a rat with stereotypical attire representing Japan, approaching a mousetrap labeled "Army – Navy – Civilian", on a background map of the Alaska Territory, referred to as future "Death-Trap For The Jap". In August 1942, the U.S. Army established an air base on Adak Island and began bombing Japanese positions on Kiska. U.S. Navy submarines and surface ships also began patrolling the area. Kiska Harbor was the main base for Japanese ships in the campaign and several were sunk there, some by warships but mostly in air raids. On 5 July, the submarine Growler, under command of Lieutenant Commander Howard Gilmore, attacked three Japanese destroyers off Kiska. He sank one and heavily damaged the others, killing or wounding 200 Japanese sailors. Ten days later, Grunion was attacked by three Japanese submarine chasers in Kiska Harbor, with two of the patrol craft sunk and one other damaged. On 12 May 1943, the Japanese submarine I-31 was sunk in a surface action with the destroyer Edwards 5 mi (4.3 nmi; 8.0 km) northeast of Chichagof Harbor. 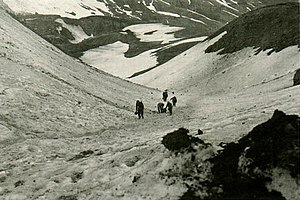 A company attached to the 4th Infantry, with Inuit guides embedded, rescued the soldiers of the 77th Division (additional reference needed) that were trapped on Attu by Japanese forces. These soldiers were trained in severe-cold conditions, and incorporated Inuit methods adapted from local guides. The 4th Inf. Reg. soldiers dispatched through Dutch Harbor to Attu Island. After landing, with help from their embedded Inuit guides, their relatively small force climbed and secured advantageous positions along Fishhook Ridge overlooking the area where American troops were trapped by Japanese forces. After the 4th demonstrated their tactical advantage, the remaining Japanese forces were reported to commit mass suicide, with some Japanese soldiers rushing medical tents, where they detonated grenades among the wounded U.S. soldiers. This unit of the 4th Infantry received a Presidential Unit Citation (memoirs of COL. P.E. LeStourgeon). The heavy cruiser Salt Lake City under fire off the Komandorski Islands. A cruiser and destroyer force under Rear Admiral Charles "Soc" McMorris was assigned to eliminate the Japanese supply convoys. They met the Japanese fleet in the naval Battle of the Komandorski Islands in March 1943. One American cruiser and two destroyers were damaged, with seven U.S. sailors killed. 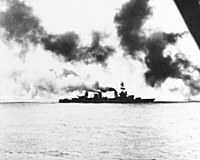 Two Japanese cruisers were damaged, with 14 men killed and 26 wounded. Japan thereafter abandoned all attempts to resupply the Aleutian garrisons by surface vessels, and only submarines would be used. On 11 May 1943, American forces commenced an operation to recapture Attu. The invasion force included scouts recruited from Alaska, nicknamed Castner's Cutthroats. A shortage of landing craft, unsuitable beaches, and equipment that failed to operate in the appalling weather made it difficult for the Americans to exert force against the Japanese. Adding to problems for the U.S. forces, soldiers suffered from frostbite because essential cold weather supplies could not be landed, nor could soldiers be relocated to where needed because vehicles would not operate on the tundra. The Japanese defensive strategy to the American attacks included Colonel Yasuyo Yamasaki not to have his forces defend against the Americans landings. The Japanese instead dug into high ground far from the shore; this resulted in fierce combat, with a total of 3,929 U.S. casualties; 580 men were killed, 1,148 were wounded, with another 1,200 men suffering severe injuries from the cold weather. In addition, 614 Americans died from disease, and 318 from miscellaneous causes, mainly Japanese booby traps or friendly fire. On May 29, 1943, without warning the remainder of Japanese forces attacked near Massacre Bay. This was recorded as one of the largest banzai charges of the Pacific campaign. Led again by Colonel Yamasaki, the attack penetrated so deep into US lines that Japanese soldiers encountered rear-echelon units of the Americans. After furious, brutal, often hand-to-hand combat, the Japanese force was virtually exterminated. Only 28 Japanese soldiers were taken prisoner, none of them officers. American burial teams counted 2,351 Japanese dead, but it was thought that hundreds more Japanese bodies had been buried by bombardment during the battle. Part of the huge U.S. fleet at anchor, ready to move against Kiska. Royal Canadian Air Force No. 111 and No. 14 Squadrons saw active service in the Aleutian skies and scored at least one aerial kill on a Japanese aircraft. Additionally, three Canadian armed merchant cruisers and two corvettes served in the Aleutian campaign but did not encounter enemy forces. 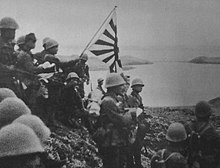 The invaders landed to find the island abandoned; the Japanese forces had left two weeks earlier. Under the cover of fog, the Japanese had successfully removed their troops on 28 July. Despite US military command having access to Japanese ciphers and having decoded all the Japanese naval messages, the Army Air Force chose to bomb abandoned positions for almost three weeks. The day before the withdrawal, the U.S. Navy fought an inconclusive and possibly meaningless Battle of the Pips 80 mi (70 nmi; 130 km) to the west. Although the Japanese troops had gone, Allied casualties on Kiska numbered 313. They were the result of friendly fire, booby traps, disease, mines, timed bombs set by the Japanese, vehicle accidents or frostbite. Like Attu, Kiska offered an extremely hostile environment. Although plans were drawn up for attacking northern Japan, they were not executed. Over 1,500 sorties were flown against the Kuriles before the end of the war, including the Japanese base of Paramushir, diverting 500 Japanese planes and 41,000 ground troops. The battle also marked the first combat deployment of the 1st Special Service Force, though they also did not see any action. In the summer of 1942, the Americans recovered the Akutan Zero, an almost intact Mitsubishi A6M2 Zero fighter. This enabled the Americans to test-fly the Zero and contributed to improved fighter tactics later in the war. The 2006 documentary film Red White Black & Blue features two veterans of the Attu Island campaign, Bill Jones and Andy Petrus. It is directed by Tom Putnam and debuted at the 2006 Locarno International Film Festival in Locarno, Switzerland, on August 4, 2006. Dashiell Hammett spent most of World War II as an Army sergeant in the Aleutian Islands, where he edited an Army newspaper. He came out of the war suffering from emphysema. As a corporal in 1943, he co-authored The Battle of the Aleutians with Cpl. Robert Colodny under the direction of Infantry Intelligence Officer Major Henry W. Hall. Many of the United States locations involved in the campaign, either directly or indirectly, have been listed on the National Register of Historic Places, and several have been designated National Historic Landmarks. The battlefield on Attu and the Japanese occupation site on Kiska are both National Historic Landmarks, and are included in the World War II Valor in the Pacific National Monument. Surviving elements of the military bases at Adak, Umnak, and Dutch Harbor are National Historic Landmarks. 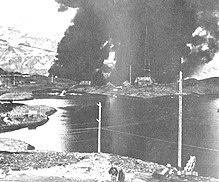 The shipwrecked SS Northwestern, badly damaged during the attack on Dutch Harbor, is listed on the National Register, as is a crash-landed B-24D Liberator on Atka Island. ^ MacGarrigle, George L. Aleutian Islands. The U.S. Army Campaigns of World War II. United States Army Center of Military History. CMH Pub 72-6. ^ Editors, History com. "Battle of the Aleutian Islands". HISTORY. Retrieved January 31, 2019. ^ Pike, Francis (2016). Hirohito's War: The Pacific War, 1941-1945. London: Bloomsbury Publishing. p. 1003. ISBN 978-1-350-02122-8. ^ Parshall, Jonathan; Anthony Tully (2005). Shattered Sword: The Untold Story of the Battle of Midway. Potomac Books. ISBN 978-1-57488-924-6. ^ Banks, Scott (April/May 2003)." Empire of the Winds" American Heritage. Retrieved 7-29-2010. ^ Nagle, John Copeland (2010). Law's environment: how the law shapes the places we live. Yale University Press. p. 39. ISBN 0-300-12629-8. ^ Commission on Wartime Relocation and Internment of Civilians. 1982. Personal Justice Denied. Washington, D.C.: Commission on Wartime Relocation and Internment of Civilians. Congressional Report. https://www.archives.gov/files/research/japanese-americans/justice-denied/aleuts-page-317.pdf. ^ Adleman, Robert H.; Walton, George H. (2004). The Devil's Brigade. Naval Institute Press. pp. 103–106. ISBN 9781591140047. OCLC 53019821. ^ Warner, Bret (2006). First Special Service Force 1942-44. Osprey. pp. 14–15. ISBN 9781841769684. OCLC 84991571. ^ "CHRONOLOGY OF THE 10TH MOUNTAIN DIVISION IN WORLD WAR II 6 January 1940 — 30 November 1945" (PDF). Compiled by John Imbrie Vice President for Data Acquisition and Research, National Association of the 10th Mountain Division, Inc. Retrieved March 17, 2016. ^ Stacey, C. P.; Canada. Dept. of National Defence. General Staff. (1948). The Canadian Army, 1939–1945; an official historical summary. Ottawa: E. Cloutier, King's Printer. OCLC 2144853. Cloe, John Haile (1990). The Aleutian Warriors: A History of the 11th Air Force and Fleet Air Wing 4. Missoula, Montana: Pictorial Histories Publishing Co. and Anchorage Chapter – Air Force Association. ISBN 0-929521-35-8. OCLC 25370916. Cohen, Stan (1981). The Forgotten War: A Pictorial History of World War II in Alaska and Northwestern Canada (Volumes 1-3). Missoula, Montana: Pictorial Histories Publishing Co., Inc. ISBN 0-933126-13-1. Dickrell, Jeff (2001). Center of the Storm: The Bombing of Dutch Harbor and the Experience of Patrol Wing Four in the Aleutians, Summer 1942. Missoula, Montana: Pictorial Histories Publishing Co., Inc. ISBN 1-57510-092-4. OCLC 50242148. Feinberg, Leonard (1992). Where the Williwaw Blows: The Aleutian Islands-World War II. Pilgrims' Process. ISBN 0-9710609-8-3. OCLC 57146667. Garfield, Brian (1995) . The Thousand-Mile War: World War II in Alaska and the Aleutians. Fairbanks: University of Alaska Press. ISBN 0-912006-83-8. OCLC 33358488. Goldstein, Donald M.; Dillon, Katherine V. (1992). The Williwaw War: The Arkansas National Guard in the Aleutians in World War. Fayettville: University of Arkansas Press. ISBN 1-55728-242-0. OCLC 24912734. Hays, Otis (2004). Alaska's Hidden Wars: Secret Campaigns on the North Pacific Rim. University of Alaska Press. ISBN 1-889963-64-X. Lorelli, John A. (1984). The Battle of the Komandorski Islands. Annapolis: United States Naval Institute. ISBN 0-87021-093-9. OCLC 10824413. MacGarrigle, George L.; Center of Military History. Aleutian Islands. Government Printing Office. ISBN 978-0-16-035882-1. Morison, Samuel Eliot (2001) . Aleutians, Gilberts and Marshalls, June 1942 – April 1944, vol. 7 of History of United States Naval Operations in World War II. Champaign: University of Illinois Press. ISBN 0-316-58305-7. OCLC 7288530. Parshall, Jonathan; Tully, Anthony (2005). Shattered Sword: The Untold Story of the Battle of Midway. Dulles, Virginia: Potomac Books. ISBN 1-57488-923-0. OCLC 60373935. Perras, Galen Roger (2003). Stepping Stones to Nowhere, The Aleutian Islands, Alaska, and American Military Strategy, 1867–1945. Vancouver: University of British Columbia Press. ISBN 1-59114-836-7. OCLC 53015264. Urwin, Gregory J. W. (2000). The Capture of Attu: A World War II Battle as Told by the Men Who Fought There. Bison Books. ISBN 0-8032-9557-X. Wetterhahn, Ralph (2004). The Last Flight of Bomber 31: Harrowing Tales of American and Japanese Pilots Who Fought World War II's Arctic Air Campaign. Da Capo Press. ISBN 0-7867-1360-7. Zaloga, Steven J. (2007). Japanese Tanks 1939–45. Osprey. ISBN 978-1-84603-091-8. Vidal, Gore (1946), Williwaw, New York: E. P. Dutton. Wikimedia Commons has media related to Aleutian Islands campaign.